Context - Currently, conventional incandescent lamps are in the process of being replaced with more energy-efficient lamps, mainly compact fluorescent lamps (CFLs). Fluorescent light has been used for many years in overhead fluorescent tubes without causing any problems. 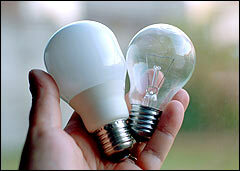 Nevertheless, certain “light sensitive” citizens’ associations have voiced concerns about compact fluorescent lamps. Do these energy-saving lamps aggravate the symptoms in patients with certain diseases? Light is essential to life on Earth and affects humans and other living organisms in various ways. For instance, the interaction of light with our skin and eyes influences our perception of warmth and cold. It also helps the body regulate processes that lead to wakefulness and rest during the cycle of day and night, and across the different seasons. When radiation reaches the skin or the eyes, it can be reflected or it can penetrate the tissue and be absorbed or scattered in various directions. This interaction depends on the wavelength of the radiation. Most ultraviolet radiation does not penetrate further than the upper layers of the skin. Although it has some beneficial effects such as helping production of vitamin D, in general it is considered to be harmful as it can damage proteins and DNA in the skin and eyes, especially ultraviolet radiation with short wavelengths (UVCs). Some people are particularly susceptible to UV radiation and become sunburned even after extremely low exposures or show abnormal allergy-like skin reactions. Radiation of longer wavelengths, including visible light and infrared radiation, is usually harmless although it can warm up exposed tissue. The interaction of visible light with the light-sensitive cells in the eye allows us to see colours. Fluorescent lamps are made of a glass tube containing a low pressure mixture of gases including mercury. The tubes are coated with fluorescent chemicals. When the current is switched on, the starting mechanisms at each end of the lamp produce electrons that excite the gases inside the tube and make them release ultraviolet (UV) radiation. This UV radiation hits the fluorescent coating, which produces light. The colour of the light produced depends on the chemical composition of the coating. Some fluorescent lamps emit more blue light than conventional incandescent lamps and therefore simulate daylight better. Fluorescent lamps have a glass envelope which filters out ultraviolet radiation but, in some cases, some UV radiation can get through. Using double glass envelopes dramatically reduces the amount of UV radiation emitted. Compact fluorescent lamps (CFLs) emit light and some UV radiation, but their electronic circuitry – like any electronic or electric device – also generates some electromagnetic fields. The magnitude of these fields, at typical operating distances, remains well below what is tolerable and typical for household appliances. In contrast to conventional incandescent lamps that only generate low frequency electric and magnetic fields, compact fluorescent lamps generate both low and intermediate frequency fields. The exact frequency range depends on the type of lamp. Some people suffering from various health conditions not related to the skin claim that the use of fluorescent lamps aggravates their symptoms. Such a link is not supported by scientific evidence. There is a need for additional studies before final conclusions can be drawn regarding several conditions. The concerns have been attributed to different characteristics of energy-saving compact fluorescent lamps (CFLs), namely flicker, the ultraviolet radiation and blue light they produce, and electromagnetic fields. Flicker in general can induce migraine and even seizures in some epileptic patients, but no such effects have been reported with properly working CFLs. There is some evidence that blue light in general can aggravate retinal diseases in susceptible patients. It cannot be excluded that photophobia, an abnormal sensitivity to light, is induced or aggravated by different light conditions. There is no evidence that fluorescent light has negative effects on people with autism, but an influence cannot be excluded. There is sufficient evidence indicating that the use of compact fluorescent lamps does not aggravate dyslexia and Irlen Meares – learning disabilities that result in difficulties with reading and spelling. There have not been any reported effects of compact fluorescent lamps on individuals with chronic fatigue syndrome, fibromyalgia, dyspraxia, or HIV. It is extremely unlikely that fluorescent lamps used for room illumination can cause snow blindness or cataracts. Exposure to certain types of compact fluorescent lamps (CFLs) with a single glass envelope may induce problems in patients who are extremely sensitive to sunlight, in particular to its UVA and UVB components. This is particularly the case when the source is close to the skin (i.e. 20 cm or less). Extremely sensitive patients include people with inherited skin diseases brought on by light, as well as people with some skin diseases which have no known causes. Unfiltered UV light from such compact fluorescent lamps could also cause skin reactions in people with lupus. Several drugs cause skin problems when used in combination with exposure to light. Compact fluorescent lamps are unlikely to be a problem. In the treatment of some cancers, several drugs are used that are activated by exposure to light and that can cause skin problems in some patients. Patients receiving such treatment could potentially show a marginally greater reaction when exposed to light from compact fluorescent lamps compared with light from incandescent lamps. These adverse reactions are expected to affect only a relatively small number of people and could be avoided by using double-envelope CFLs which are better at filtering out ultraviolet radiation. For these diseases, more research is needed to establish whether compact fluorescent lamps constitute a higher risk than incandescent lamps. Some patient groups are concerned that using compact fluorescent lamps instead of conventional incandescent lamps would aggravate certain diseases. The main causes for concern are flickering and the ultraviolet radiation, electromagnetic fields and blue light that these lamps produce. Flickering lights can aggravate the symptoms of certain diseases such as epilepsy and migraines. There is, however, no evidence that the use of traditional fluorescent tubes or compact fluorescent lamps have the same effects. There is no evidence that electromagnetic fields from compact fluorescent lamps cause or aggravate existing symptoms in patients with certain diseases. There is no evidence showing that flicker and electromagnetic fields from compact fluorescent lamps pose a risk to sensitive individuals. The only property of compact fluorescent lamps that could pose an added risk is the ultraviolet and blue light radiation emitted by such devices. In the worst case, this radiation could aggravate symptoms in roughly 250 000 people across the EU, who suffer rare skin conditions that make them exceptionally sensitive to light. The general population could receive significant amounts of ultraviolet radiation if they are exposed to the light produced by some single-envelope compact fluorescent lamps for long periods of time at distances of less than 20 cm. The use of double-envelope energy-saving lamps or similar technology would mitigate risks both for the general population and for light-sensitive patients.